According to Dictionary.com, rhythm is a movement or procedure with uniform or patterned recurrence of a beat, accent, or the like. Rhythm is present in every song or piece of music. It’s also present in many poems and nursery rhymes. It can be simple or complicated. It may be composed of many different pauses and repetitions or just a simple standard, 1234, beat. 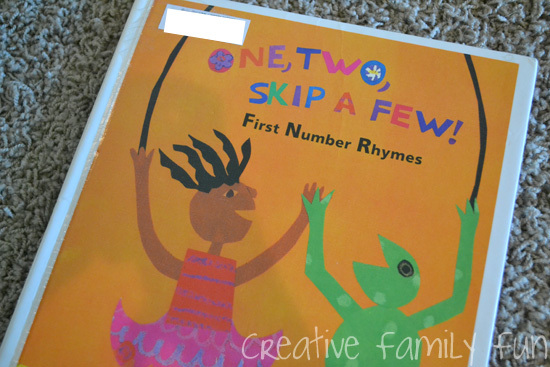 We recently explored rhythm through the use of the book, One, Two, Skip a Few! First Number Rhymes by Roberta Arenson. 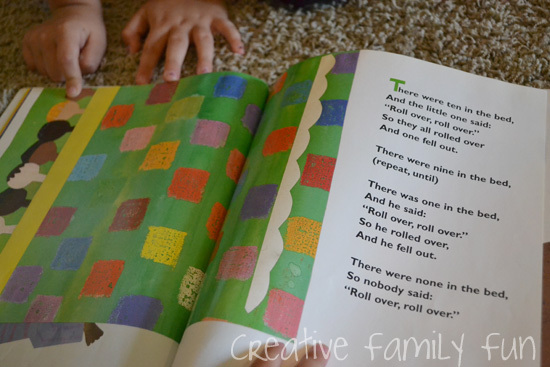 All of the rhymes have a definite rhythm to them, which made this activity lots of fun. We started with simple clapping. 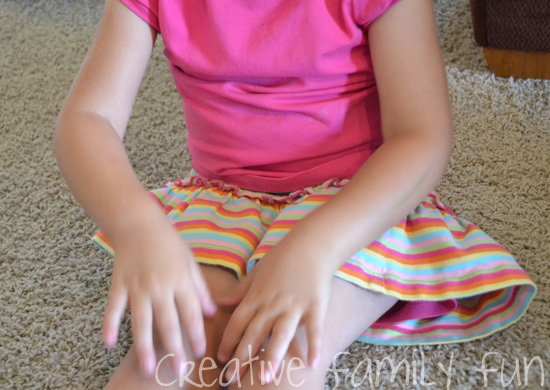 After we established a rhythm, we used the clapping to set our speed. We explored different speeds, trying fast and slow. We also tried a simple leg pat. Pat, pat, pat, pat. Once we mastered this simple rhythm, we moved on to something a bit more complicated and combined the claps and the pats. Not only did we have fun, but we learned about a basic music term, rhythm. We learned that rhythm can help us remember the words to a rhyme. We also learned to have a whole lot of fun and add a new dimension to nursery rhymes by providing the accompanying rhythm. How do you use rhythm in your play? Love these ideas! We make almost everything into a song. If a book rhymes I sing my way through it. We LOVE 10 in a bed. I make up songs and rhymes for cleaning up, going to bed, washing hands. And I try to greet them with a song in the mornings! 🙂 We'll have to check out that book! Thanks for sharing at The Sunday Showcase. That book is on our library list. Thanks for sharing! Newest GFC follower. Love for you to return the follow. I love using rhyme in my Kindergarten class. We learn lots of traditional rhymes and try to write our owns… Many years ago one of my Kindergarten class wrote a poem about Humpty Dumpty, the process was FUN! 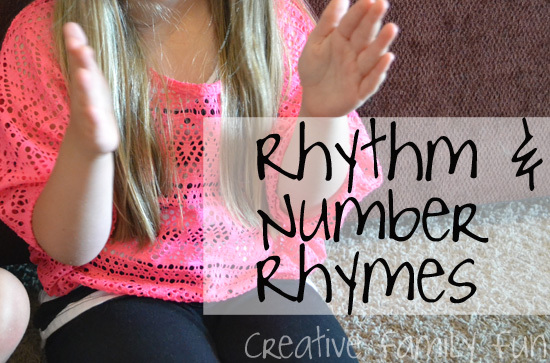 A great way to use rhymes and rhythm to learn numbers! Music is such a great learning tool. It is also important for learning how to play instruments and singing. I need to remember to do more of this with my daughter. She is learning how to play the piano and how to keep the beat. Thank you so much for linking up to Mom's Library. I LOVE number rhymes. We love five little speckled frogs, five little ducks went out to play, and five little monkeys hanging in a tree (all the ones that start with 5 I guess). My kiddo loves it when Mr. Alligator snaps that monkey right out of that tree. 🙂 Nothing like making learning fun.